Hey M$M crew! Today I have a post for you by AF from Accidental Fire. Ever since I started M$M, I've been so concerned about the amount of student loan debt in America. I've seen hundreds and hundreds of stories from readers. It's crazy. The student debt crisis in America is a silent crisis for the most part. I'd venture to say it's mentioned in the media even less than the National Debt, which at least gets obligatory coverage when politics or the Federal Budget are discussed. Bobby has done quite a few posts about student loans on this blog and he's someone who conquered his own loans in spectacular fashion. His story, however, is not the norm and the crisis is only getting worse. Need proof? Remember this post? I recently came across some fascinating research that maps America's student debt. Since I'm a geographer by trade and a mapping nerd, I dove into it with enthusiasm. 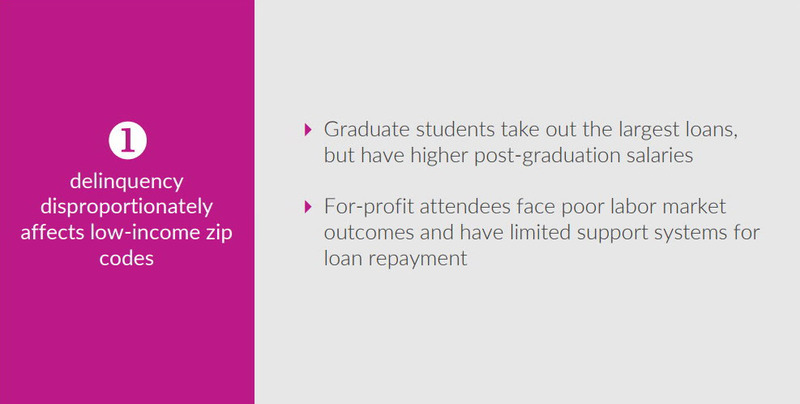 Affluent zip codes have high average student loan balances per household. 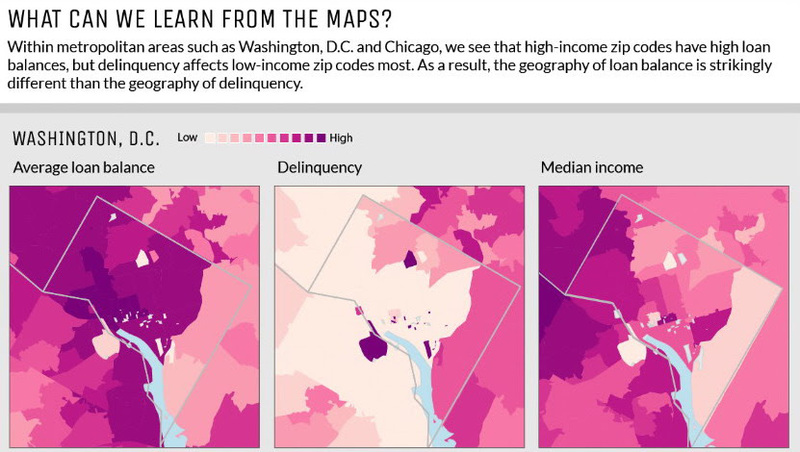 Higher delinquency afflicts low-income zip codes. Within metropolitan areas, the geography of loan balances is very different than the geography of delinquency. That last bullet is kind of a combination of the first two bullets, but with a specific focus on urban areas. Since I live just outside of Washington D.C. which is one of the highest cost of living areas in the country, let's look at D.C. If you're not familiar with D.C. the west side of the city, especially the northwest, is absurdly wealthy. The east side has much lower incomes, and the southeast is poor in many areas. There are exceptions of course including the rapid gentrification happening in Northeast D.C., but in general, those are the simple rules. I'd be remiss if I didn't mention that D.C has a lot of colleges, including expensive choices like Georgetown and George Washington University. So the maps show the wealthy people are carrying far more student debt, but have lower delinquency rates. And the poorer areas are carrying less debt but have much higher delinquency rates. I have to admit, there's a bit of a “duh” factor here. Without seeing the data mapped, had you asked me how those data points would look I would have probably predicted this exact scenario. The wealthier people are sending their kids to super expensive schools, but still borrowing. And they, of course, have a much greater ability to make their loan payments on time. 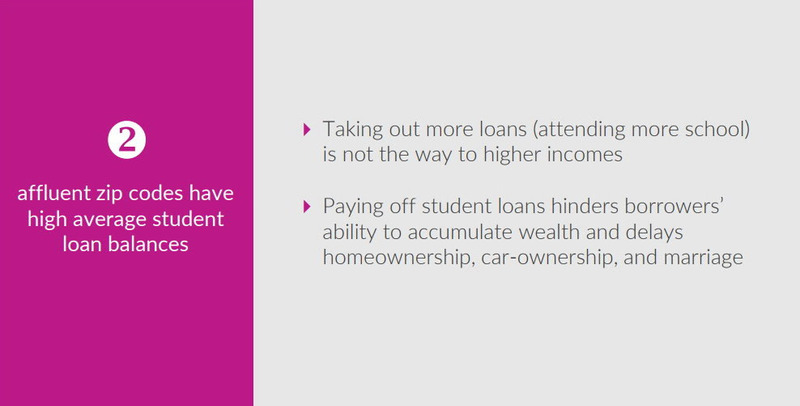 A key thing here to remember is that the wealthier people are likely also in overall debt themselves, not just student loan debt! As we personal finance warriors know, just because someone is driving around a Porsche Cayenne and lives in a 4500sq ft. home doesn't mean he or she is not in debt. Actually, it's more likely they are. The data clearly shows the higher the income, the more credit card debt a household has. According to this report, households with an income over $160,000 have an average of more than $11,000 in credit card debt. Lifestyle inflation is real. So it doesn't surprise me that the wealthy are still borrowing heavily to send their kids to expensive colleges since they're likely also borrowing to have their mega-SUV's and houses, and all the accoutrements in it. On the other hand, the poorer zip codes are borrowing less and are much more delinquent on the student loans they do have. Again, no surprise. Lower income families tend to have less education and thus wouldn't be sending their kids to college at the same rates. And even when they do send them they'd likely send them to cheaper colleges. The mapping page links to a far more detailed analysis and report of the data. They discuss two theories to the correlation of income, loan amounts, and delinquency rates. Again, this makes sense on the surface. The second bullet here describing “for profit” colleges is referring to more trade-based schools that often have a lower barrier to entry. As median income increases in a zip code, so does the average loan balance, until income reaches approximately $140,000. After that, the relationship becomes flat. Here's a snapshot of student loan delinquencies at the national level from the report. It's apparent that the South, especially the Southeast are struggling with student loans. Another visual standout on the national map is Arizona and New Mexico. It appears that these two states do indeed have high default rates on student loans as this report corroborates. New Mexico actually has the highest default rate by percentage. Here are the top ten default rates by percentage in America by state. 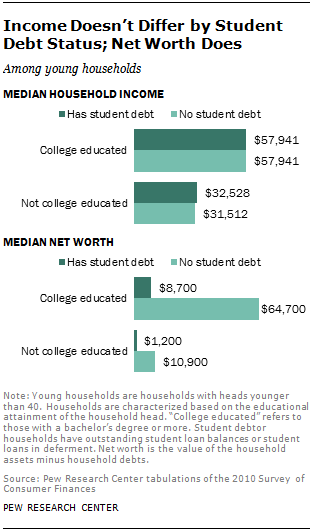 The Pew Research Center found that college-educated households with student debt have one-seventh the wealth of people without debt. No surprises here. If you have debt like that – even if it comes from going to a very good school, it's going to impact your net worth substantially. Notice the small print in the chart above, that's net worth data for households where the head of household is under 40. So if you get out of college at 22, or say 24 for a graduate degree, that means 16 or 18 years later when you're 40 you will likely still be suffering from the impacts of those student loans on your net worth. If you have student debt you should try to crush it as soon as you can. Even if you're making your payments on time and seemingly handling it, the data and research clearly show it's hindering your financial well being and future. There's lots of advice out there including tons on this blog. You could use Dave Ramsey's debt snowball method or other methods, but first and foremost you have to track your spending, budget, and stop wasting money on things you don't need. Paying off large sums of money requires discipline and good habits, and the simple rule of spending way less than you earn is the place to start. Do you find the data in the map matches your personal situation? I’ve been following Accidental Fire for awhile now, and this is definitely one of my favorites. Throughout the article, I found myself and those who I surround myself with, relating directly to the statistics being shown. For instance, I have a bachelor’s degree and my fiancée has an associates degree. Although she has an associate’s and is considered college educated, most consider college educated as a 4-year degree. Our salaries differences match the discrepancy above for college educated vs. non-college educated. Furthermore though, because we have ZERO debt, our net worth matches that of the data listed above. Debt truly goes along way in hindering the wealth that people can obtain. It’s the biggest obstacle in my opinion of achieving ever lasting wealth. What good is a six figure salary if you’re paying off 3 degrees over the next 20 years? It’s almost worthless in the long run. The unfortunate thing is most don’t realize this. I actually have a close friend who I fear is under the illusion that more degrees will equate to wealth. He already has a bachelors and makes very good money for our age (25). Unfortunately though he has close to 50k in debt and now is going back to get his MBA. And after that, he will be off to Law School…I’m not sure what the end goal is in all that, but it easily reads to me as believing the paper will equal wealth. The cumulative debt will cripple that belief. Great comment Sean! I value education as much as the next person and I love to learn, but I also think there are many ways to earn a great living and have a great career without a college education. Or without the continual pursuit of more degrees. Bobby has done some posts here about whether or not everyone “needs” to go to college, and another favorite of mine is Mike Rowe. He’s the guy from the old “Dirty Jobs” show and he’s done quite a bit of writing on this topic and long been a proponent of the value and benefit of trade jobs. Thanks for reading as always Sean! As human geography teacher, I will be using these maps when we discuss development at the end of the year. I have all 9th grade so hopefully, they take it to heart and start saving themselves with summer jobs to help cut the costs. Most of my students will go to college. Thank you!!! I always like seeing posts like these that lay out the data on student loans, even if it does paint a bleak picture. I started taking college classes when I was 15 through dual-credit while in high school. SO MANY people kept asking why I was doing it, that it was stupid, and so forth because I was taking classes through a community college. Even one of my teachers said it was dumb to be doing it! Anyways, I got most of my general education out of the way by the time I graduated high school and was able to get my bachelor’s degree in 2.5 years and graduated at the age of 20! I ended up with about $21,000 in student loans which I’ve since paid off. I’m a BIG believer in doing community college if you can and if your degree allows it (most do). I also like trade schools as well. Although I dislike how people constantly say to go to community college or trade school as if that’s the fix to the student loan crisis. There are wonderful, great jobs to be had by going to trade school. You can save a lot of money by going to community college first. BUT…I think we need to really look at government-backed student loans and state funding for colleges. That I think will help lessen the increasing student loan burden. Congrats to you Colin, that’s amazing that you took college classes as a 15 year old! What a unique and ambitious path to success! I have a buddy who “only” has an associates degree from a community college and he’s super successful and makes around $150k a year. Bottom line, he’s a hard worker, and that beats out degrees time and time again! The info is startling but not surprising. The one correlation you didn’t mention though is government help. I went to an expensive 4 year college and graduated with a dual degree in aeronautical and mechanical engineering. Going to one of the best engineering schools in the country was worth it in terms of job placement and value of an education. However in my experience at my school, there are plenty of “rich” and “poor” kids there, but it all comes out in the wash when you see the students from poorer areas have little to no loans and those from more well off areas have insane loans. Rich parents and poor parents can send their kids to the same schools, but the difference is that poorer students get government financial aid, where rich ones get nothing. I graduated with the same 2 degrees as my boyfriend but I have more than twice the student loans, all because of how our parents file their taxes. My parents put up $25,000+ each year because that’s what was in the budget and I’m still walking away with more than $80,000 in loans. I have friends who’s parents put up nothing and have $10,000 in loans. So on the map, the richer areas aren’t necessarily borrowing more because they choose to, but because the government doesn’t offer help, even if the student’s burden becomes astronomical. All this while the poorer students come out on top with little to no loans and can start their net worth mountain much more quickly. Interesting insight Bridget! I’m not familiar with the income requirements or cut-offs for government financial aid when it comes to college tuition, so that would greatly complicate the data. Interestingly enough the website I linked to and the study didn’t go into that aspect. Perhaps it gets too complex, especially since they ran all this data for every zip-code in America. Really cool post! I’m a big data nerd as well so this was really interesting to me. Some parts I was not surprised by, but the part about affluent zip codes holding a lot of debt was fairly surprising. Glad you enjoyed it Kyle!